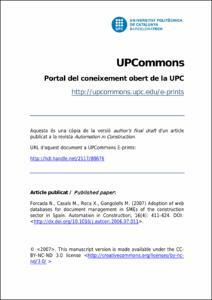 Forcada, N.; Casals, M.; Roca, X.; Gangolells, M.
This paper presents a web-based tool designed to improve internal and external document management for small and medium-sized enterprises (SMEs) in the architecture, engineering and construction (AEC) sector. For each specific project, the system creates an organisational document structure to be downloaded to the stakeholders’ PCs or servers and also to the web-based project management system (WPMS) that is being used to manage the entire project. A survey was conducted in Spain to define new user requirements in which the need for set rules on how to organise all the information related to a project was identified. The survey revealed that SMEs need to improve document management for large-scale projects. Based on the requirement studies, a concept model of information flow was developed and implemented in a web-based tool designed according to current standards and theories of classification and organisation of information related to construction. This system was evaluated by an independent panel of experts: academics, construction company representatives and software vendors. Forcada, N., Casals, M., Roca, X., Gangolells, M. Adoption of web databases for document management in SMEs of the construction sector in Spain. "Automation in construction", Juliol 2007, vol. 16, núm. 4, p. 411-424.